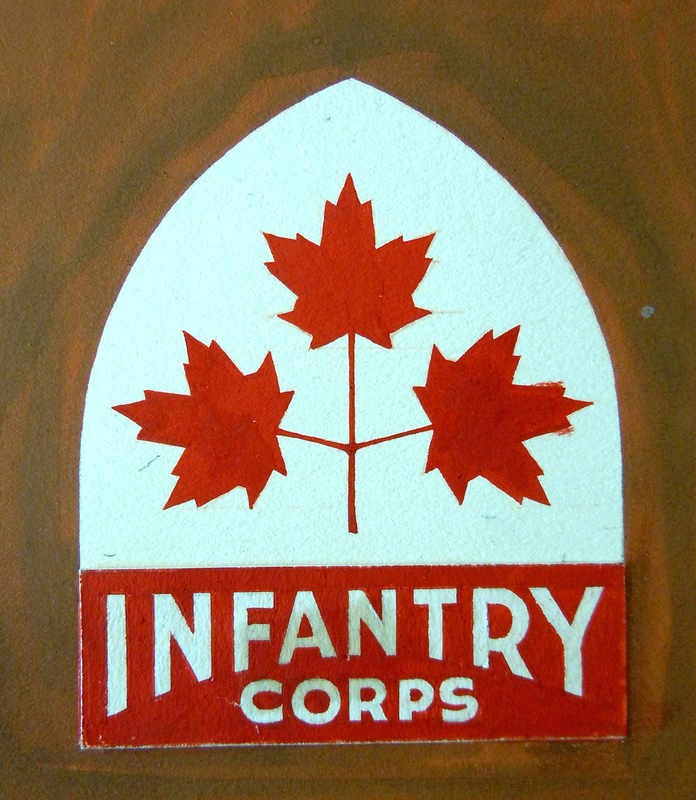 Following a suggestion made by the Adjutant-General of the Canadian Army, the Army Council, on 22 June 1944, agreed that ‘a distinctive badge or flash’ should be authorized for the Canadian Infantry Corps. What is surprising is not the decision to approve such a distinction but, rather, that it took so long before the suggestion was even made. An approved shoulder title for the Canadian Armoured Corps, officially formed in August, 1940, had already been in wear as the de facto insignia for instructors posted to the Canadian Armoured Corps Reinforcement Unit, all unattached armoured troops as well as for most units in the 5th Canadian Armoured Division. 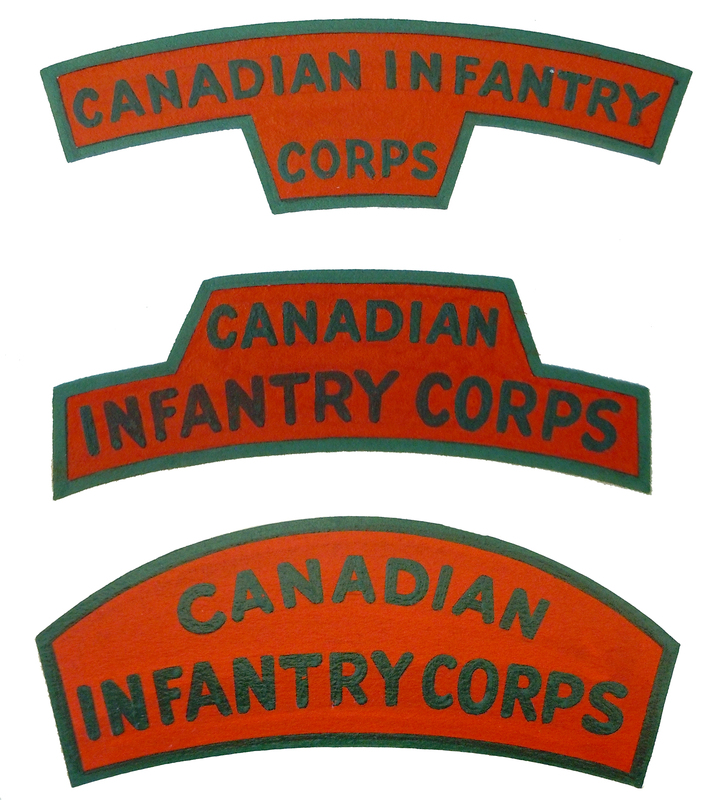 Other Corps, including the Royal Canadian Engineers, Royal Canadian Army Service Corps, Royal Canadian Corps of Signals and many others, had had corps-specific shoulder titles on issue for almost two years. The delay in authorizing a flash for the Infantry can be explained by the system of training that existed at the beginning of the war which saw recruits enrolled directly into regiments and trained by a regimental cadre. As the war progressed this was found to be inefficient and Basic Training Centres (BTC) were established to take on this responsibility. The instructors were originally seconded from infantry regiments and wore the unit title of their parent unit – if one existed. Over time, an increasing number of the instructor cadre either had no regimental affiliation or were transferred to the BTC establishment and had no regimental title to wear. Further, while trainees in other Corps were authorized to wear the Corps title immediately upon issue of their uniform, Infantry trainees, who were not yet affiliated with a regiment, had no insignia to wear. These two scenarios led to a lack of identity and to morale issues. Recognizing this, the Army proposed a distinctive title for the Canadian Infantry Corps. The National Resources Mobilization Act (NRMA) had originally been passed in 1940 and gave the Canadian government the authority to conscript men into the Canadian Army. At the time these draftees were limited to home defence and were not liable for overseas service. By 1942, however, military forecasts of personnel shortages forced a referendum on the question of overseas service. In spite of major divisions across the country, including in Quebec where the Canadian Army was seen as an Anglophile bastion, the NRMA was amended and the government was given the power to draft Canadian men for General Service, i.e., sent overseas to serve in a combat role. At the time of the Army Council approval for the badge, in June 1944, the NRMA debate was still raging and the amendment was scheduled to be enacted in December of that year. It was in this environment that the question was raised about the eligibility of NRMA personnel to wear the new insignia. Fig 1 – The three original designs closely followed the standard shape for Corps titles. The red and green colours represented both Line and Rifle Regiments. By the end of July 1944, three possible designs were submitted for selection. These patches had two elements in common; both emulated the shapes in use for unit titles (shoulder flashes) and both used Scarlet, representing Infantry of the Line, and Green, in recognition of Rifle tradition. Fig 2 – A selection of titles proposed during the second round of design. 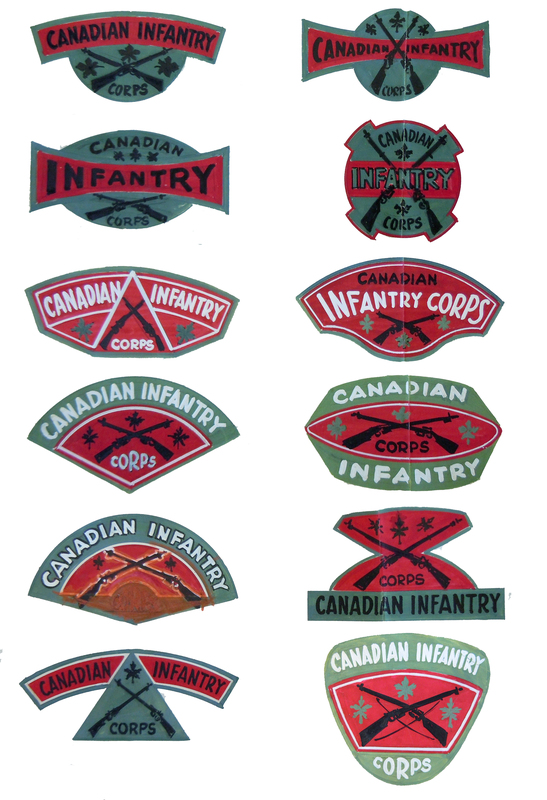 These titles used the elements found on the Canadian Infantry Corps cap badge. None of the three designs was found to be suitable – due solely to their similarity to regimental shoulder flashes. This is unusual as all other Corps used cloth insignia identical in shape to regimental titles. One of the suggestions was even in the exact same shape as that previously approved for the Canadian Armoured Corps. 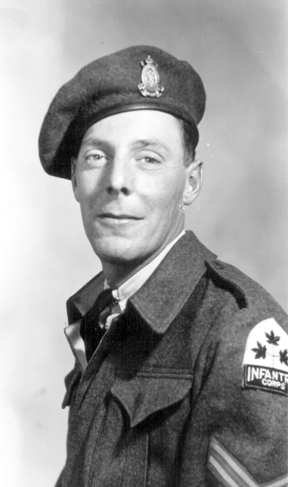 The Master-General of the Ordnance suggested that new designs be developed and that the existing Canadian Infantry Corps cap badge could provide a theme. This led to a flurry of new designs, most of which now incorporated crossed rifles and a sprig of maple leaves. The red and green colour motif was retained although some suggestions included white. Duguid called upon approved heraldic elements and suggested that the Canadian Infantry Corps patch be limited to red and white – by Royal proclamation the official colours of Canada since November 1922. This same proclamation stated that the “main device… to represent Canada” was to be three leaves sprouting from a single twig. And that the badge for Canada was a red maple leaf. Duguid also suggested that, as the maple leaves were readily identifiable as representing Canada there was no need to use the word ‘Canada’ or ‘Canadian’ as this would be unnecessary repetition. Taking these elements into consideration Duguid proposed a design which was quickly accepted. Fig 3 – The original artwork for Colonel Duguid’s approved design. Duguid also wanted to incorporate the Infantry motto “Acer”, meaning swift – keen – eager – penetrating. He had hoped that it would become as well known as “Ubique” had become for the Artillery and the Engineers. Following design approval it remained to have samples of the badge manufactured for examination. The Inspection Board of the United Kingdom and Canada (IB) arranged for three examples to be made up. Two of these samples were made with embroidery on two pieces of Melton wool while the third sample was embroidered on one piece of white Melton. The two-piece samples were selected and, after confirming with the Department of Munitions and Supply that a sufficient quantity of red and white Melton wool was available, a contract (Contract Demand Clothing D-46) was let with the Brocklehurst Swiss Embroidery Company of Toronto, for 50,000 pairs. These were to be delivered in lots of 10,000 pairs per week. FIG 4 – 4 – The Melton title worn here by a Corporal in the Canadian Infantry Corps with no regimental affiliation. He is most likely on the cadre of a Basic Training Centre. This draft was circulated in October 1944, mere weeks before enactment of the new NRMA and the prohibition may have reflected the almost institutional dislike of NRMA soldiers, derisively termed ‘zombies’, by the vast majority of Active Service volunteers. To ensure that the Routine Order would survive a judicial review the Judge Advocate General’s office was asked to provide legal comment. They stated that there was no legal objection to excluding the NRMA. Nonetheless, the Director Administration for the Canadian Army pointed out that no other Corps title had ever been limited to General Service soldiers in any of the other Corps of the Canadian Army. This was supported by the Director of Ordnance Services who pointed out that NRMA soldiers of other Corps wear the shoulder badge of their respective Corps and that it would be inconsistent with present policy to refuse NRMA soldiers to wear the badge. In response the Chief of the General Staff wrote that his “reaction is that NRMA should not wear it (the patch)”. Amidst the conflict the question was sent back to the Army Council, which, on 26 October 1944, concurred with the draft RO – that the badge should not be worn by NRMA soldiers. Accordingly, Canadian Army Routine Order (CARO) 5053 was promulgated on 4 November 1944. FIG 5 – The full title, as approved by National Defence Headquarters. The DOC also made clear his dislike of the maple leaves claiming that other Corps used only letters or names. He also felt that the badge should be inverted in order that it be worn with the point facing downwards. Finally, he raised the question of the prohibition against NRMA men wearing the patch, pointing out that NRMA men of other Corps were entitled to wear their corps patch. In spite of his letter, NDHQ did not budge on any point claiming, in a draft letter, that CARO 5053 would not be revisited. While the issue of the title moved forward in Canada, reinforcements, upon arrival in the United Kingdom, were wearing a title that looked like a formation patch. Canadian Military Headquarters (CMHQ), in communications with Ottawa, stated that the patch was inappropriate and confusing. Additionally, there was no infantry corps title in use overseas, and no ability to provide Melton titles such as those being worn by personnel from Canada. With the re-organization of the reinforcement and training battalions in the UK there now existed a large demand for CIC titles. To meet this need, and to address the issues of Melton cloth, size and design of the Canadian title, CMHQ designed and approved a two-line title, printed dark green on scarlet (these are also found in coloured embroidered material.) Ironically, the CMHQ design was almost identical to an early submission which emulated the shape of the Canadian Armoured Corps title. FIG 6 – Printed and embroidered titles, manufactured in the UK, to CMHQ’s design and worn overseas. 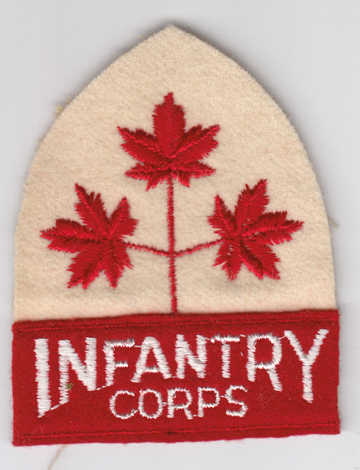 In Canada, within a year of the first issue, the Canadian Infantry Corps patch was modified by unstitching the red Melton portion from the shield portion and wearing it by itself, resulting in a simple “Infantry Corps” shoulder title. 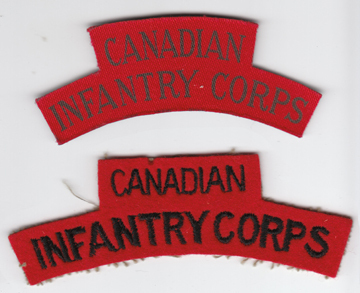 These Infantry Corps titles were eventually manufactured by themselves, without the leaf portion. This appears to have been in response to the argument that the title was confused with formation patches, and that it soiled easily. FIG 7 – 7 – Following dissatisfaction with the original patch due to its size and that it soiled quickly, the lower ‘tab’ of the patch was removed fro the ‘shield’ and worn on its own. The author wishes to thank Bill Alexander for his invaluable assistance and editorial review. Very interesting article.To the point,concise and clear explanation of the subject.I would appreciate more on the subject of shoulder titles. Excellent article. Very informative and to the point.